Masoud Kaveh-Baghbadorani, a doctoral student in UC's Department of Physics, conducts research to imrpove the performance of plasmonic devices. What if one day, your computer, TV or smart phone could process data with light waves instead of an electrical current, making those devices faster, cheaper and more sustainable through less heat and power consumption? That's just one possibility that could one day result from an international research collaboration that's exploring how to improve the performance of plasmonic devices. The research led by Masoud Kaveh-Baghbadorani, a doctoral student in the University of Cincinnati's Department of Physics, will be presented on March 5, at the American Physical Society Meeting in San Antonio, Texas. "We have tried this with an alloy of silver, now we're trying it with gold. The purpose is to better understand and try to model how energy is getting transferred from the semiconductor nanowire into the metal. There are many different variables here to better understand this energy transfer or energy coupling," explains Kaveh-Baghbadorani. "We are working on improving the coupling between the semiconductor nanowires and the metal coating." 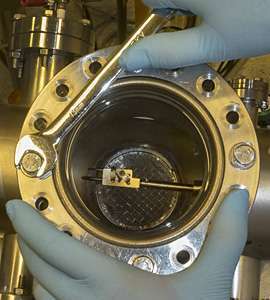 "The metal results in high resistivity losses," explains co-researcher Hans Peter-Wagner, a UC professor of physics and Kaveh-Baghbadorani's advisor. 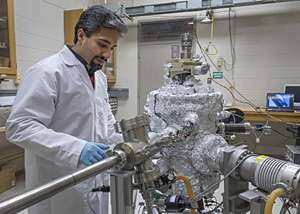 "We want to overcome these losses by pumping energy from nanowire excitons, or electronic excitations, into the metal. This is the reason why we do this research." 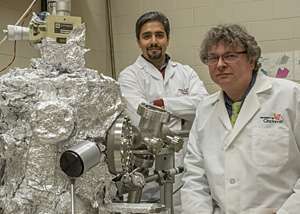 Masoud Kaveh-Baghbadorani, left, and advisor Hans Peter-Wagner, a UC professor of physics. "When we use different organic materials in the plasmonic structure, we can extend the lifetime of excited charge carriers, therefore they can travel longer within the structure before they get captured by the metal," says Kaveh-Baghbadorani. "By changing the organic spacer thickness, we can control the energy transfer process." Future applications could include faster and enhanced performance of computers and other smart electronic devices, solar cells or even lead to a super-lens that results in a vast improvement of the current generation of microscopes. "We're far from being at the end of potential applications for this research and constantly thinking about new uses. The research field is extremely rich, there's no end in sight," says Wagner.